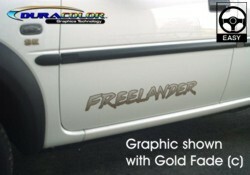 Dress up your Land Rover Freelander with these "Freelander" body side graphics. Available in one of three (3) different color schemes - Black, Silver or Gold (shown). Each graphic is packaged with one (1) Driver Side and one (1) Passenger side graphic.